(Nanowerk News) Researchers have synthesized a tiny structure from 32 gold atoms. This nanocluster has a core of 12 gold atoms surrounded by a shell of 20 additional gold atoms. 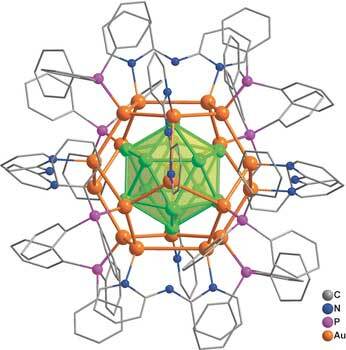 As the scientists report in the journal Angewandte Chemie ("A Ligand-Protected Golden Fullerene: The Dipyridylamido Au328+ Nanocluster"), the unusual stability of this cluster results from electronic interactions with amido and phosphine ligands bound to its surface. Aggregates of a few metal atoms, known as clusters, are increasingly used in catalysis, bioscience, and nanotechnology. Since the discovery of a pyramidal structure of 20 gold atoms, “golden cages” have become a new class of clusters with unusual structural properties. It was predicted that a cluster of 32 gold atoms should be very stable and would structurally resemble C60 fullerene. C60 is a hollow sphere made of 60 carbon atoms arranged into a structure of 5- and 6-membered rings, just like the facets of a traditional soccer ball. “Golden fullerenes” are predicted to have a broad spectrum of potential uses, including as transporters, molecular labels, and catalysts. A team led by Jun Li and Quan-Ming Wang (Tsinghua University, Beijing, China) has now achieved the first synthesis of a nanocluster made of 32 gold atoms in solution. The synthesis involved the direct reduction of gold-containing precursors. The formula of the compound is [Au32(Ph3P)8(dpa)6]+[SbF6-]2 (where dpa = 2,2’-bipyridylamido ligand and Ph3P = triphenylphosphine ligand). The structure consists of an arrangement of 12 gold atoms in a cage of 20 gold atoms—described as Au12@Au20—that is protected by eight Ph3P and six dpa ligands bound to the surface. With a combination of analytical methods and computer calculations, the scientists were able to completely determine the structure: its geometry, its chemical bonding relationships, and its electronic structure. The “golden core” of the new cluster compound is a hollow icosahedron (a shape with 20 triangular faces) made of 12 gold atoms surrounded by a “shell” of 20 gold atoms in the form of a dodecahedron (a shape with 12 pentagonal faces). The bonds between the shell and core are very strong. The eight Ph3P ligands are bound to eight gold atoms of the shell, forming the corners of a cube. The dpa ligands are arranged so that their midpoints form the corners of an octahedron. They are not bound through their amido groups, but instead through the two nitrogen atoms in their two aromatic rings, which each bridge two gold atoms.